Hey guys! 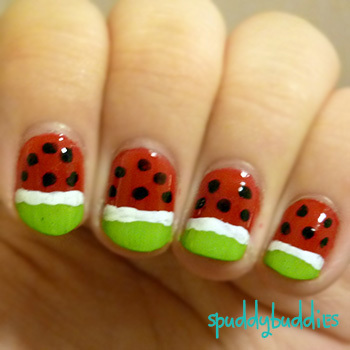 Today I want to show you one of the first few nail art designs that I started out doing - watermelon nails!! They're really easy to do and you don't even need any proper tools. When I just started out, I had no tools whatsoever, not even an orange stick. My only tools back then were skewer sticks and toothpicks so you can totally make do with those if you have them. This is not my first attempt at watermelon nails, #357 would sound about right. Just kidding. This is possibly my 6/7th time doing these nails. They are so fun to do and if you mess up, well, keep on trying. I used Love & Beauty - Red, Sally Hansen - Lickety Split Lime, China Glaze - White on White and a black nail art pen. I may or may not have tried to cover some booboos that I made on my nails, hehe. So you want to know how I did these nails? Okay, first I painted two coats of red polish and waited for them to dry. Then I taped about half an inch from the tip and painted one thick coat of Lickety Split Lime and peeled the tape off quickly. Using a striper brush and White on White, I created that white line between the red and green polish. Finally, I used a large dotting tool to create the watermelon seeds. Have you done watermelon nails before? Did you like how they turned out? 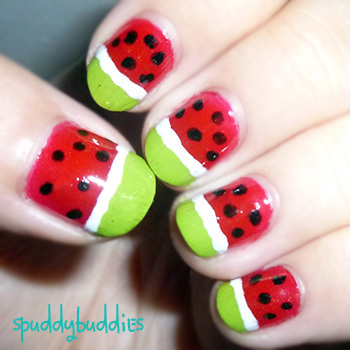 Would you try doing watermelon nails if you've never done them before? Who likes watermelons in general? I know I do. Hey, great fun, these nails! Thanks for joining our party. BTW. did you notice that little product that I am recommending at the end of my Halloween nails article the other day on our blog, the Fine Craft Guild? I think you might like it: it helps you to make perfect thin lines, in 1 go. Oh la la.... what a time saver! Found your blog on "I love my post" and I do love this post. What a lovely idea, very original. Loved your blog so have followed, i'm looking forward to your next tutorial. You totally should! Thank you for coming by. This is adorable. I recently had a similar kind of strawberry nails and ppl are def always looking. ;) So well done with that eye catcher!